This section describes how to use the agent management (alias agent) and scheduler (alias agent_scheduler) extensions for DHCP agents scalability and HA. Use the openstack extension list command to check if these extensions are enabled. Check agent and agent_scheduler are included in the output. There will be three hosts in the setup. 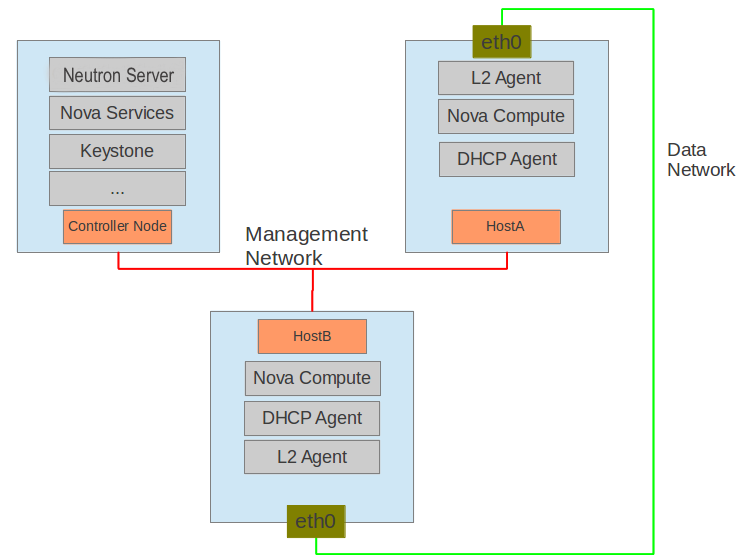 OpenStack controller host - controlnode Runs the Networking, Identity, and Compute services that are required to deploy VMs. The node must have at least one network interface that is connected to the Management Network. Note that nova-network should not be running because it is replaced by Neutron. In the above configuration, we use dhcp_agents_per_network = 1 for this demonstration. In usual deployments, we suggest setting dhcp_agents_per_network to more than one to match the number of DHCP agents in your deployment. See Enabling DHCP high availability by default. Admin role is required to use the agent management and scheduler extensions. Ensure you run the following commands under a project with an admin role. Every agent that supports these extensions will register itself with the neutron server when it starts up. The output shows information for four agents. The alive field shows True if the agent reported its state within the period defined by the agent_down_time option in the neutron.conf file. Otherwise the alive is False. This command is to show which networks a given dhcp agent is managing. In this output, last_heartbeat_at is the time on the neutron server. You do not need to synchronize all agents to this time for this extension to run correctly. configurations describes the static configuration for the agent or run time data. This agent is a DHCP agent and it hosts one network, one subnet, and three ports. The output shows bridge-mapping and the number of virtual network devices on this L2 agent. A single network can be assigned to more than one DHCP agents and one DHCP agent can host more than one network. You can add a network to a DHCP agent and remove one from it. When you create a network with one port, the network will be scheduled to an active DHCP agent. If many active DHCP agents are running, select one randomly. You can design more sophisticated scheduling algorithms in the same way as nova-schedule later on. It is allocated to DHCP agent on HostA. If you want to validate the behavior through the dnsmasq command, you must create a subnet for the network because the DHCP agent starts the dnsmasq service only if there is a DHCP. Assign a network to a given DHCP agent. Both DHCP agents host the net2 network. Remove a network from a specified DHCP agent. You can see that only the DHCP agent for HostB is hosting the net2 network. Boot a VM on net2. Let both DHCP agents host net2. Fail the agents in turn to see if the VM can still get the desired IP. Use the previous commands to assign the network to agents. Log in to the myserver4 VM, and run udhcpc, dhclient or other DHCP client. Stop the DHCP agent on HostA. Besides stopping the neutron-dhcp-agent binary, you must stop the dnsmasq processes. Run a DHCP client in VM to see if it can get the wanted IP. Stop the DHCP agent on HostB too. Run udhcpc in the VM; it cannot get the wanted IP. Start DHCP agent on HostB. The VM gets the wanted IP again. An administrator might want to disable an agent if a system hardware or software upgrade is planned. Some agents that support scheduling also support disabling and enabling agents, such as L3 and DHCP agents. After the agent is disabled, the scheduler does not schedule new resources to the agent. After the agent is disabled, you can safely remove the agent. Even after disabling the agent, resources on the agent are kept assigned. Ensure you remove the resources on the agent before you delete the agent. After deletion, if you restart the DHCP agent, it appears on the agent list again. You can control the default number of DHCP agents assigned to a network by setting the following configuration option in the file /etc/neutron/neutron.conf.